What you make is important. If you don’t make something customers want and need, you won’t be in business long. How you make your product is important as well. Customers care where your materials come from and how you put your products together. These two statements should be self evident in today's business world. However, this next statement is not. After photographing businesses for 15 years, we believe the single most important piece to marketing your business is the people that are in it! The team your company assembles is your first (and most important) customer. So while it's tempting to market your business by leading with "We make this..." or "This is how we make our products..." statements, have you considered this: it would be better to market your business by telling the stories of the people in your business. Tell your customers what they stand for and why they work for you. Your best customers want to know two things: "Who are you?" and "Are you for me?" This approach works and it's how we began our work for Local First's “Guide to Local Living”. It is a magazine to help those wanting to direct their spending toward locally owned businesses. The guide highlights businesses who stand out from the crowd. This year Local First chose three businesses, all in different industries: Hungerford Nichols, Farmhaus Cider and Cento Anni. Hungerford Nichols is an accounting firm that recently celebrated their 75th anniversary in Grand Rapids. Farmhaus Cider is a Hudsonville based cidery that began in 2015. Cento Anni is a custom woodworking and furniture business in Holland. On the surface, none of these businesses compete in the same industry. One provides accounting services, another brews cider, another makes custom furniture. But all three do have one thing in common: People. Armed with an overview article written by a professional writer about each business, I was tasked with supplying photographs for the feature articles and chose to focus on the people involved in each business. And this is our belief when it comes to marketing your business: it would be better to market your business by telling the stories of the people in your business. Tell your customers what they stand for and why they work for you. The product that Hungerford Nichols sells is accounting and tax services. They offer them in a consultative way for most of their company's history. As with any financial advisor, clients must trust their tax and accounting professional and Hungerford Nichols knows that. The people in their firm are the difference maker. So how did we approach the photo session? We featured one of their shareholders, Brett Karhoff and their marketing manager, Heather Halligan, for the Local First feature. 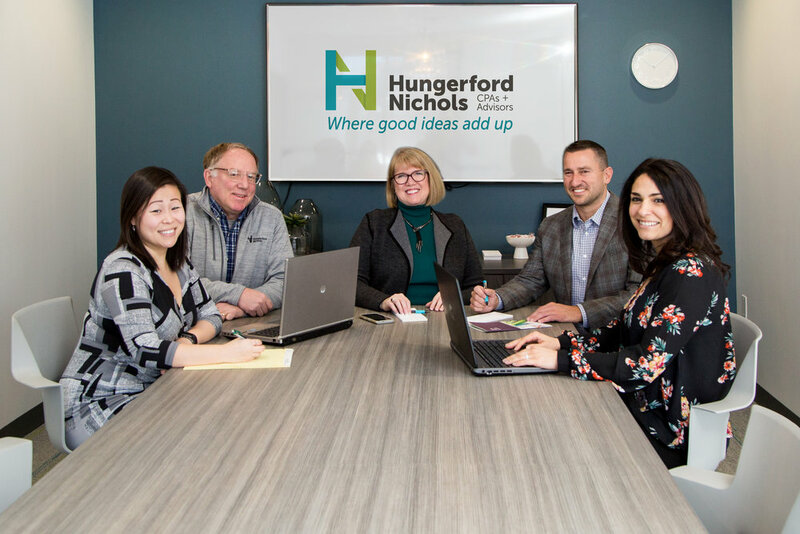 Using the newly renovated office space as the backdrop for portraits of not only them, but of some of the teams at Hungerford Nichols, we created a collection of individual and multi-person images to choose from. 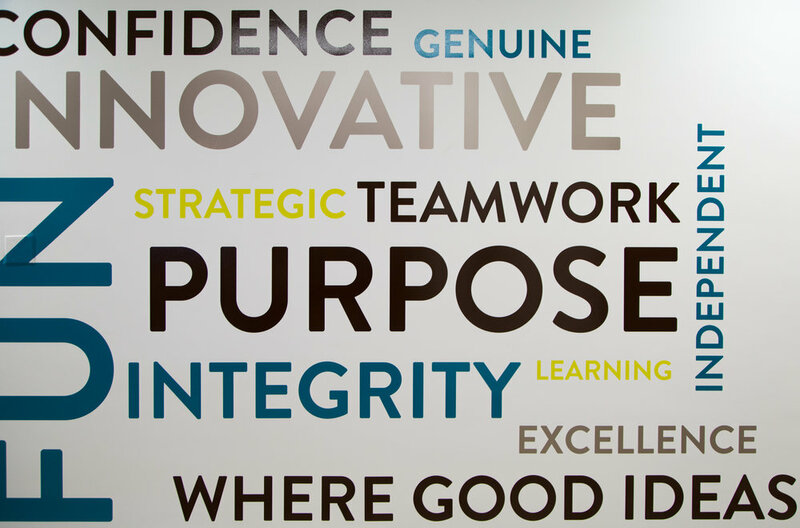 In their newly renovated lunch area, they created a wall of words that features the things their company wants to be known for. As it tells the outside world who they are, it had to be included in the collection of images as well. The product that Farmhaus Cider sells should be obvious: hard cider. Both the cider they brew and the space they utilize for their operation are unique. But it's the people in their business that make their story special. We photographed John, the founder of Farmhaus, who began the business on his family's 150 year old farm. In addition, we photographed cider maker, Ben, a former lab chemist, who left a traditional corporate job to follow his cider brewing dreams. Yes, they make great cider. Yes, it's available throughout Michigan, but it’s the people that make a business like Farmhaus Cider successful. Between John and Ben, they are building relationships with the goal of turning people into raving fans of Farmhaus Cider's products! A custom woodworking and furniture business, Cento Anni sells the obvious: custom wood pieces created with a certain vision in mind. That vision is where the customer's desire and woodworker's ability come together. We captured portraits of not only Ed and Randy in their downtown Holland space, but we made sure to capture some of the people on their team. Watching them collaborate with their team on specific projects was wonderful to see. It showed me their business is all about people. As you can see, while none of these businesses operate in the same industry, they do have one thing in common: they are made up of people. If you're not marketing your business with the resource your competition can never duplicate, the story of the people within your company, we would love the chance to connect and see how this process can help you grow your business. Don't ever forget, your best customers want to know two things: "Who are you?" and "Are you for me?"